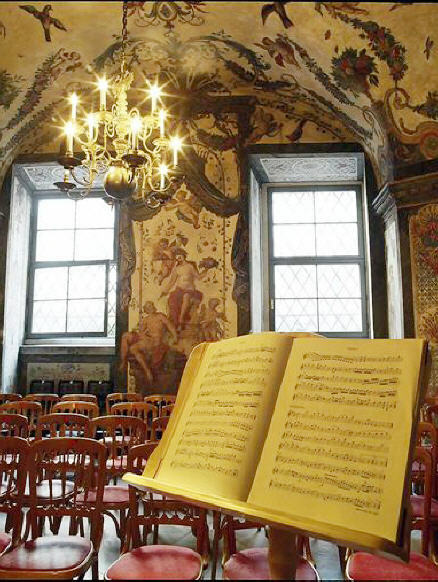 This concert hall, with its intimate atmosphere, is located in the same house - Singerstrasse no.7 in the monastery in the teutonic order - in Mozart's first former home address in Vienna. Due to renovation works made by the archaeological institute, the Sala Terrena cannot be played in the next time. The chosen music program is not just played in an unique ambience, but played by a professional quartet. Our Mozart ensemble performs chamber music and popular classical pieces by the most famous Austrian composers. Very experienced and well balanced, the string quartet carries on the old and revered Viennese musical tradition. Let the ensemble take you to a world full of lust and impassioned music. The baroque art and Mannerism architecture of the ground floor hall enchants the eye, while its form creates wonderful acoustics. High standard music, the original atmosphere of the Sala Terrena and the historic costumes worn by the musicians combine into a luxurious classical music experience. Turn your night in the town into a journey back to Mozart s time. Concert hall "Sala Terrena" Vienna Concert hall Sala Terrena in the Mozart-House in Vienna The Sala Terrena (from Ital. : ground floor hall), located in the historic inner city, nearby St. Stephen s Cathedral and Hofburg, is part of the convent of the Deutscher Ritterorden and was built in the second half of the 12th century. Built in Venetian Mannerism style you see strong influences from the baroque age. Its beautifully designed frescos, which show rich ornamentation and scenes of the mythology, create an excellent ambience for enjoying high standard music. Experience baroque art and lifestyle with all your senses. Wolfgang Amadeus Mozart´s performance at the Sala Terrena By orders of bishop Colloredo of Salzburg, one of the most important sponsored of the Mozart family, Wolfgang went to live in Vienna. In 1781 he stayed in the quarters of the convent assigned to him. Amadeus performed several concerts in this magnificent, and one of the oldest concert halls in Vienna. Come, feel and enjoy Mozart s spirit at the Sala Terrena. Due to reconstruction works the concerts will take palce until the end of November in the hall "Deutsch Ordenshaus".